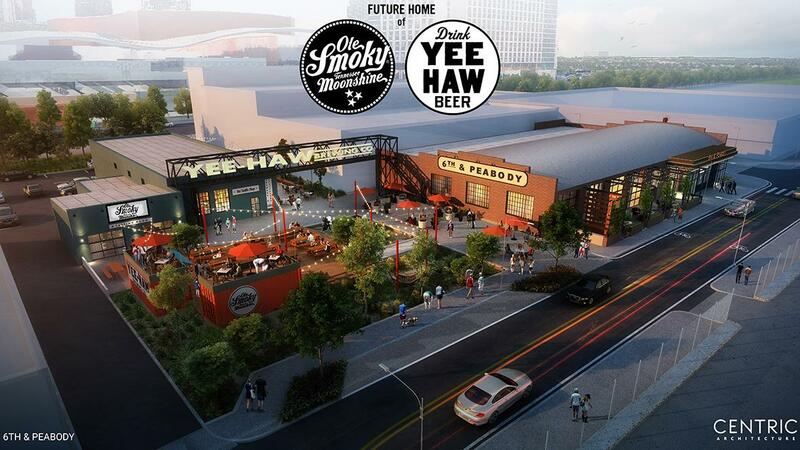 The owner of Johnson City, Tennessee-based Yee-Haw Brewing Co. is eyeing a fall opening for his future brewpub to operate from a SoBro warehouse located at Sixth Avenue South and Peabody Street. Joe Baker told the Post in October 2017 he was targeting a late spring opening for the facility, which will sit roughly one block south of the Music City Center. Baker said Thursday the team has rescheduled for the fall. A permit, valued at $3.5 million, has been issued, with Nashville-based R.C. Mathews Contractor handling the build-out. Some work already has been undertaken. Of note, Ole Smoky Tennessee Moonshine Distillery, a live music venue and a small WMOT broadcast space also will operate from what will be called 6th & Peabody (pictured). Baker founded Yee-Haw in mid-2015 and eventually will relocate its headquarters to Nashville but maintain an East Tennessee presence. The SoBro property has an address of 423 Sixth Ave. S. and is part of the former Madison Smith Naturally auto dealership campus.